Leaves are deeply dissected for an attractive lacy texture. Maintains good color in heat, resistant to leaf scorch. Essential to Asian garden style. 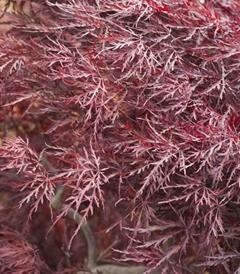 Bright cherry red new growth, leaves are deeply dissected for an attractive lacy texture. Plant in a location protected from strong winds. Stake trunk for more erect growth or leave alone for a full cascading effect. Pruning is best kept to a minimum, but if needed should be done in late fall to mid-winter. Mulch helps to retain soil moisture and keep roots cool. Click on the "About Us" tab to find planting instructions.